As a Fairfield County wedding photographer, there are so many great wedding venues to photograph at including the Pavilions at Penfield Beach, Fairfield Museum and History Center, The Burr Mansion, the Brooklawn Country Club, and the Patterson Club. One of my favorites though, is the Candlelight Farms Inn. Candlelight Farms is one of the best Connecticut wedding locations in Fairfield and Litchfield Counties, and a gem of a venue for a Fairfield County Wedding Photographer. The venue has incredible views for wedding attendees to enjoy, regardless of the wedding being held indoors or outside on the extensive grounds of the property. This picture was taken inside at the Candlelight Inn. As this image proves, the venue often is not as important as enjoying the moments that are created within each space. At the center of the picture is the flower girl, who has become the life of the party. She grins widely as she is spun about the room, dancing in the carefree way that only a child can. The bride, groom, and their other guests celebrate around the little girl, whose eyes are as bright as the neon pink glow necklace she wears. 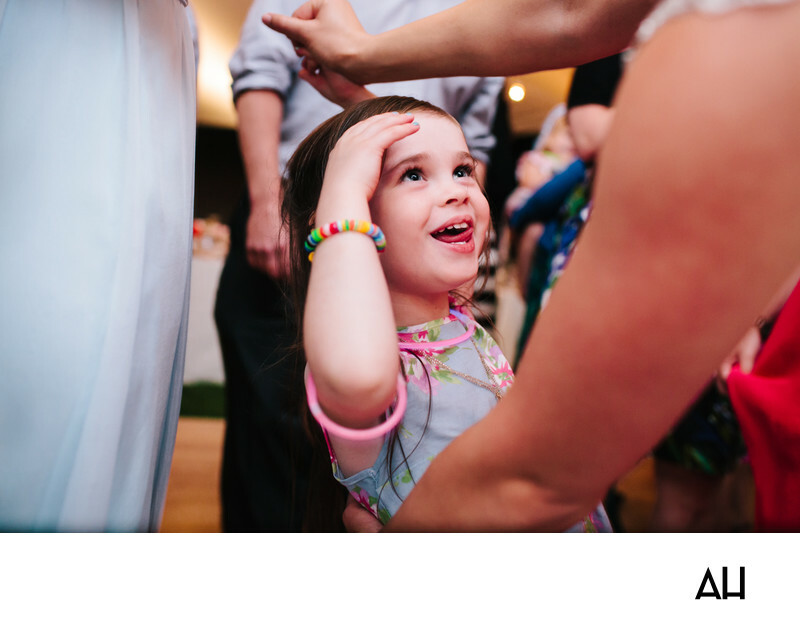 Matching the necklace is a pink glow bracelet that is a bit too big for the flower girl, and it slides down her arm as she raises her arms up to be twirled by another guest. A multi-colored beaded bracelet also adorns her tiny wrist and she wears a pale blue dress designed with pink flowers. She is a reminder of the innocence and uninhibited delight that comes with being a small child. She is at the center of a day filled with love, the ultimate symbol of pure joy.